Eatin' After Eden: related articles! 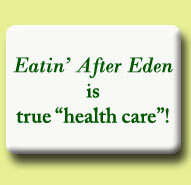 "Eatin' After Eden strikes a very healthy balance between exposing deception, promoting the science behind wholesome dietary choices, and imparting Biblical truth." FRUCTOSE FLNAFLD IN U.S. CHILDREN & ADOLESCENTS! CARAMEL COLOR IN FOODS - IS IT SAFE? WULZEN FACTOR, WHAT IT IS & WHY YOU NEED IT! "WOE UNTO THEM THAT CALL EVIL GOOD AND GOOD EVIL"
"FATS THAT HEAL, FATS THAT KILL"
ALUMINUM COOKWARE: Must I give up mine? BUTTER IS BETTER; VEGETABLE OIL IS WORSE! GLUTEN-FREE IS NOT HEALTHY FOR MOST, YET OATS ARE! THE "PALEO DIET": SOME POWERFUL PRINCIPLES! HEART HEALTH PLUS: White Flour Vs. Avocados! 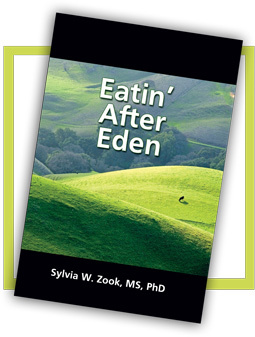 "In Eatin' After Eden, Dr. Sylvia Zook translates true science and Biblical teaching into applicable day-to-day guidelines for the modern audience that seeks enhanced health in a fallen world. Many of the premature deaths that befall the western world could be averted if everyone who wanted to bestow the ultimate gift would share copies of this book with friends and family." I really agree with placing footnotes at the bottom of the page instead of at the back of the chapter or the book. As a careful reader, I thank you for that and that convenience." "Regarding your wonderful book, the science is very solid and we have incorporated a number of your suggestions into our every-day diet…It makes good common sense to do so. And you can quote me on that!" ALZHEIMER'S DISEASE - What If There Was A Cure?